If you are thinking about having fireworks at your Destination Wedding in Riviera Maya - GREAT! (They are sure to look awesome and wow all your guests!). However there are some important factors you should know about and consider before adding this wow factor to your Wedding Day. The first thing we suggest doing when you become interested in adding fireworks to your wedding is to contact your appointed wedding coordinator at your chosen resort. As each resorts/venue has different policies and regulations when it comes to fireworks, it is best to know exactly what rules you’re dealing with as they can vary considerably. It is best to know from the start what your resort will and won’t allow. Take for example some resorts (especially along the Riviera Maya strip) that have large palapas along their beaches, or incorporated into their grounds, will not allow ground-based fireworks. The straw-like material on the roofs of these structures are very flammable, resulting in fireworks not being permitted on the property grounds. If you find yourself with a resort that does not permit fireworks from their grounds do not fear! These resorts will (and do) allow fireworks to be fired from a boat or barge in the sea. This ensures that the resort structures are 100% safe whilst still giving you your beautiful moment. Use a fireworks company that has been authorized by local Civil Protection and can obtain the necessary permit. 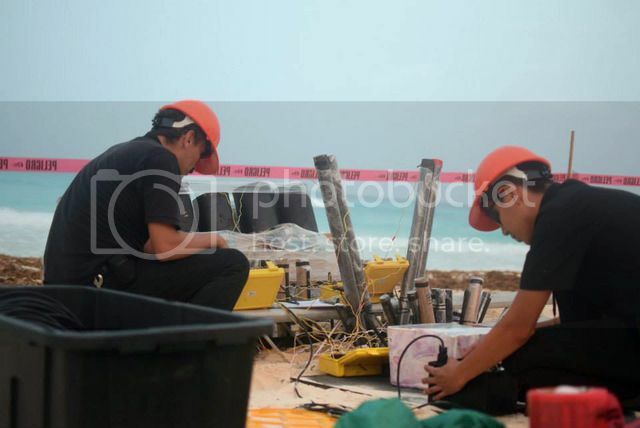 As one of the top firework and special effects companies in Riviera Maya, we take safety VERY seriously. After all, we are dealing with explosives! We believe safety should be the number one rule on site and we train each member of our team to take every safety measure possible. When it comes to laws associated with Fireworks in Riviera Maya, it is very important that the company you use has been authorized by local Civil Protection. This organization needs to be notified when events are taking place that require fireworks. Gaining permission from Civil protection gives us the go ahead to proceed with the event. It means there has been acknowledgment that the event is going to happen in safe place and that nobody outside a trained team from a reliable company will be handling the explosives. The last thing we need to gain in order to distribute fireworks at your event is a SEDENA Permit. This permit classifies that the company is legal and is complying with all updated fire laws in order to work with explosives. Use a fireworks company that is trustworthy and reliable. As you can see from the above, it is very important you choose a company that is reputable. We want you to be 100% confident that your WOW moment is going to come from a company of great experience and a top-notch service! If you have any questions when it comes to having fireworks or special effects at your wedding, please do not hesitate to contact our team. We have more than 20 years experience in this field and it would be our pleasure to work with you and help you along the way to your dream day! Promedsa is one of the top fireworks and special effects companies in Cancun/Riviera Maya. They work with clients from all over the world to add the 'WOW' factor that they are looking for into their events. Weddings is an area Promedsa is particularly experienced in and they take great pleasure in making every couple's dreams come true.